Flowers are proven to cheer you up! Planning is right up there with succession planting. Why plant more tomatoes before we can handle the blessings we already have? But planning more stuff to plant? That would be like buying the winter coats when stores put them out in August. Before it's cold. Before we've outgrown the old ones. Before they are ON SALE! Maybe you have dropped the pile of control issues I'm carrying. If you have been careful not to step in it, you may have even planned a project before you started it. This post isn't for you. You probably wrote the blog I'm going to rip off. Just kidding. 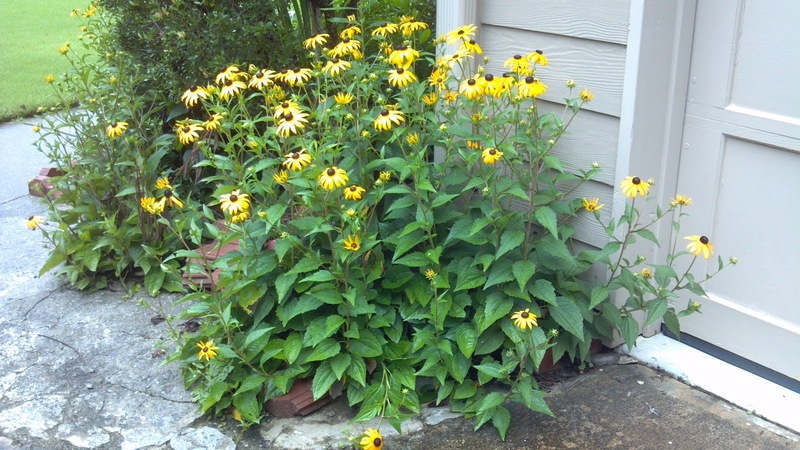 This garden planning blog is for remedial gardeners. I haven't read a blog for remedial gardeners so I can't rip you off. Here is a post from July 4 you will probably want to read too. It gives good BOSS intructions. I have a day-trading hobby that is WAY more lucrative than gardening. The two things seem very dissimilar at first but... they are both dirty. You always lose something. There is just enough success to keep trying. We'll think of garden planning in those terms. 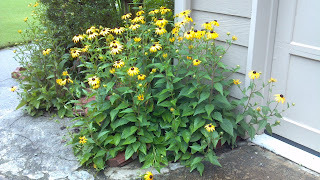 Rudbeckia reseeded in the cracks of the sidewalk. EASY to grow! The first lesson in financial planning and garden planning is diversification. This keeps you from building trellises all summer because you planted all climbers, and also ensures you will get SOMETHING to live. Don't put all your money in gold. Don't put all your money in Euros either. If you plant 20 varieties of heirloom tomatoes, notorious for their weak immune systems, one case of fusurium wilt could wipe you out. Squash vine borers don't care that your pumpkins have little fruit and your kids are learning so much by watching them. 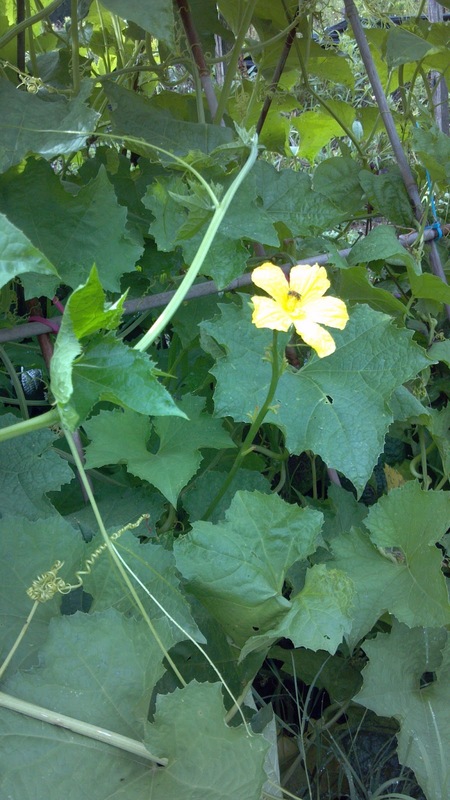 However, squash borers don't eat tomatoes and fusurium doesn't take such a toll on squash. A remedial gardener's favorite tool on the internet is the beautiful garden pictures - reminders of all the things I've done wrong or have yet to do at all. Today it reminded me of cilantro. Where there is cilantro, there is planning. It wants sun but not heat. Cilantro is the brain teaser of gardening. 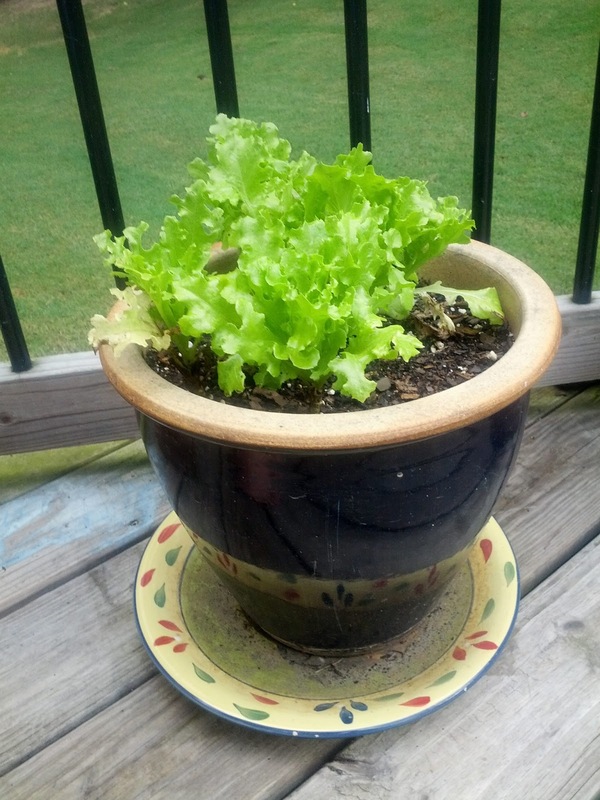 Put some lettuce in your garden. Lettuce is like buying Treasury bonds: dependable. It will offset the grief cilantro gives you. Lettuce will happily hop in the car with you, go to the mall, the frat party and Aunt Maddie's funeral with you, chatting and telling jokes the whole way. You now have four plants from four different plant families. Something is bound to live. They are all edible plants so you might get additional encouragement when you pick something instead of buying it. The cilantro and lettuce need some cool weather. The great news about garden planning is that you only have to do it once. Well, maybe four times if you are really keen on crop rotation. Eight times if you have a mild winter season. My garden plan is never finished because I am always finding new seeds and I never actually finish a plan. I don't really need to because what works in my garden might not work in yours. What worked for the guy who wrote the catalog might not work for you either. The weather will make a difference. Soil changes. Every year is a new year. Just plant something. Make adjustments if you need to. Farming is not an exact science. You should! I would like to see your cilantro!